1. Need for a Fuel Station for Mechanical and electric operated vehicles could be located on the Greenore Road close to The Liberties. 2. Craft industries could be developed more such as Boatbuilding traditional and/or Fiberglass. 3. Fruit farming could be encouraged on the 2 mile stretch from Carlingford to the Greenore turn. 4. As we are between Dublin and Belfast Crematorium could be located on the mountain as there is going to be pressure on burial space in the not too distant future and such activity would have spread affects being in close proximity to hotels and Restaurant and churches thus bringing potential for creating more sustainable jobs in the area. 1. At the moment there is much clutter in areas such as The Back Lane leaving little if any room for legally parking motor vehicles. Trinity Close and Abbey Court have similar problems with many parts of the footpaths being blocked with little room if any for Wheelchair accessibility. At the Square we have a “tined sardine affect” with vehicles parked at McKevitt’s Hotel and surrounding shops. Underground parking could be considered if it would not prove too costly in this current economic climate. a. An alternative to this would be to make Carlingford a walk around town with a shopping precedent built west of the Clos Na Manoc on the Greenore Road with an entrance from the North of St Oliver’s National School in Carlingford. b. Another alternative would be to build a shopping complex on the Greenore Road. 2. Communes may be a reality for future population as the nuclear family is being eroded ghastly and if this trend continues I can see settlements needing accommodation like farm animals but of humane standards. Here the parent or parents would go to work while all would live in a commune settlement. 1. Water sport could be developed more as there is much potential with the resource such as Carlingford Lough and water activities. As well hill walking is an activity that is great for recreation and exercise especially as our society is ghastly becoming obese. 2. More playgrounds could be developed and the school grounds should be negotiated in this respect as they are mainly idle after school except for football matches etc. CCT Camera’s would be a necessity here due to present day social activity of one kind or another. To reduce the above we have to have family resources such as competitive services in close proximity of the population. AS well we need to encourage more people to use public transport and discuss with the public to see what is required of the system by the consumers. For cycling to be increased we would need bicycle lanes where appropriate. There is need for care here if bicycle transport were said to use footpath and walking areas. Not forgetting wheelchair access and the Barcelona agreement when planning here. The may be conflict between the Medieval and modernity of new planning. In Glasgow for example they made a [pigs arise] of the City. I feel a look at Mullguy (pronounced Mullgahey) which is 1.5 Miles north of Bearsden in Glasgow. This village is a treat a walk around town centre. 1. There is much above that would help such as promoting craft industries more possible knitting local produce and fruit farms as well as encouraging foreign investment but there could be conflict if the area is to be tourist dominated as to the scope and scale of such industry. A fish processing plant could be seen as a possibility not forgetting hydro power on the Carlingford Lough. 2. One important thing necessary for employment stimulation is to keep costs down so as market prices can be kept at a level to attract customers to the area. 	Cobbler, Petrol Station, Garage, Motor Trader, Hospital, Crematorium, Tailor, Sports Shop, Telecommunications Centre, Cinema, Jewelers, Bakery, Hatchery are just a few of many that are not located within the medieval town of Carlingford. While the range is good it could be better as good is not good enough in today’s interdependent economy as competitors are always getting more on their menus. 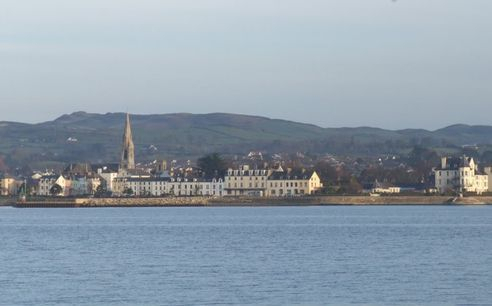 Being competitive is vital for Carlingford now especially in time of a world recession and our close proximity to Northern Ireland which can be seen as a threat as much of current trade comes from NI and UK. A Good exchange rate needs to be given by businesses and individual businesses will have to be more active here as state purse strings are under pressure. I feel that much of the present planning in the town makes the place like a Sardines in a tiny tin- with too little room for parking when new housing were constructed. High Rise buildings will destroy the Medieval Town. However I feel King John’s Castle could be restored. At present I am sleeping on that one.